We’ve made posters just like Boots’ teacher helped him with at school, and we’ve created a living room salute out of old boots, an extra beret and Dad’s favorite mug. They’ve adopted new Bear Force bears, and they’ve set an old alarm clock to Daddy Time. As soon as I can find a globe, we’re going to add it to the display so we can track Dad’s travels around it. 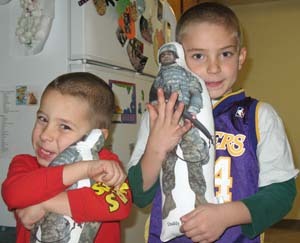 The biggest hit, though, arrived in a battered brown shipping box over the weekend: A 17-inch Hug A Hero doll featuring Dad in full battle rattle. Helmet, body armor, the works. The choice of picture would not have been my first choice, and I chuckled as I remembered the Washington State kids whose photo of his dad with a rifle was banned from school. That wasn’t my issue, though. I didn’t like it because Dad’s wearing his helmet, which means the guys have to look hard to see his face. They overlooked it at first, in fact. The dolls are not cheap – $27.95 for the 17-inch one-sided model we ordered – but each involves custom work so the cost is understandable. I ordered two, lest the guys fight over custody of Dad. It was money well-spent, and they wound up costing less than the Bear Force dolls that, while they remind the guys of Daddy, clearly aren’t their father. I heard about Hug A Hero, in fact, while I was waiting to pay for the Bear Force dolls the day Dad left. “There’s a company that will make a doll out of a picture of their dad,” a soldier behind me in line said. He couldn’t remember the Web address, but it wasn’t too hard to find. We could have added audio as well. Hug A Hero offers a voice recorder for an extra $8.95, but I knew Dad would never go along with that. Since they’ve arrived, the Daddy dolls have eaten breakfast with us each day and snuggled the guys to sleep each night. There’s some talk of them accompanying us during the coming soccer season, so Daddy can be at the games, too. Big Guy’s not so sure about that one. Showing up with a doll might ruin his manly reputation. So for now Daddy’s confined to quarters, but he still gets all the hugs and kisses his sons can’t give him in real life at the moment.